Blue-crowned Motmot - known in Nicaragua as the Guardabarranco. Click on picture to see video! Photo by Max Schellekens. More than 700 bird species have been documented in Nicaragua to date. Our staff member Jeffrey McCrary, a scientist research birds in Laguna de Apoyo and other parts of Nicaragua, accompanied a group of birdwatchers organized by El Porvenir in a trip earlier this year, where they saw about half of them in just over a week of birdwatching. Click on the Blue-crowned Motmot to see a half-hour video about the trip. Among the more common hummingbirds in the western region of Nicaragua is Salvin's Emerald, Chlorostilbon canivetii. Photo Max Schellekens. A Salvin's Emerald doing what hummingbirds do best. Photo Max Schellekens. Contact us if you would like a birdwatching guide. We can arrange a birdwatching tour of Laguna de Apoyo Nature Reserve or other locations in Nicaragua. The dry season in Nicaragua, which encompasses the first several months of the year, was especially hot and dry this year. Forest fires raged through parched lands throughout the country, especially in protected areas, such as Volcano Masaya National Park. Almost all forest fires in the tropics are started by humans, and we are sure that the fires which burned hundreds of hectares of brush and forest on the sides of the Masaya Volcano were no exception. In fact, someone was caught setting fires, although catching someone does not return the great losses caused in nature. It was a severe dry season, so the elements were especially susceptible to a forest fire. This weekend, FUNDECI/GAIA participated in a tree-planting activity in Volcano Masaya National Park, and here are some photos which depict the activity. Volunteers came from all directions, and together, we planted about one hundred stakes which will, hopefully, become trees. Special thanks to Apoyo Spanish School student Elizabeth Loudon for doing her part! The Masaya Volcano is smoking behind the reforestation volunteers. Photo Jeffrey McCrary. The reforestation activity was done with stakes from trees with branches that can be planted directly. Not all trees do this, of course, but some of these species are found in the Volcano Masaya National Park. We cut branches from some large trees, and planted them in holes 1/2-meter depth in the areas where forest fires raged during April. Trees were planted from cut stakes. Photo Jeffrey McCrary. 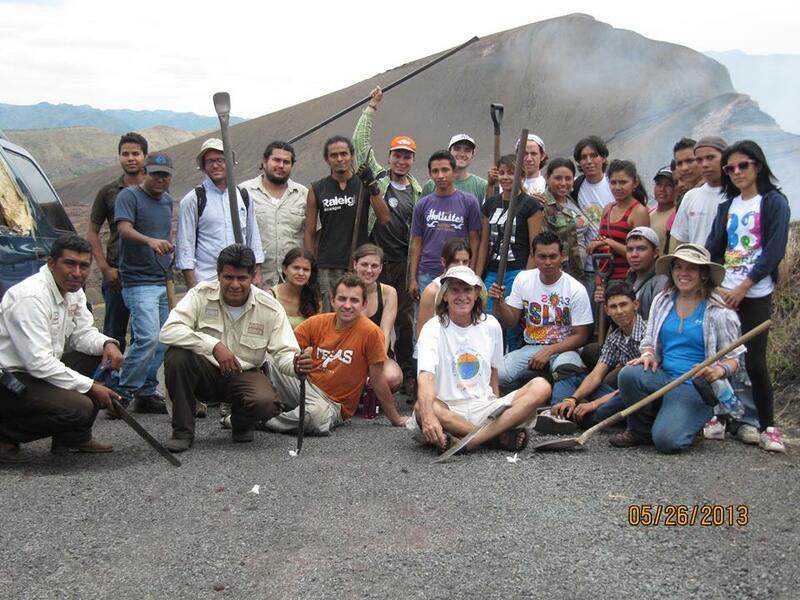 Our reforestation project was done by volunteers from all directions-Nicaragua, Europe, and the United States. Every volunteer was enthusiastic about helping their natural heritage prosper. Work as a volunteer in Nicaragua is not always meaningful, but we came back knowing we participated in a great activity. Burned areas are all around! Ilse plants a Sacuanjoche tree. Photo Jeffrey McCrary. More stakes arrive foor planting. Photo Jeffrey McCrary. Environmental volunteers arrive. Photo Jeffrey McCrary. The Volcano Masaya crater gapes behind Elizabeth. Photo Jeffrey McCrary. Natasha digs like a pro. Reforestation volunteers came from Carazo, Managua, Nindiri, Masaya, and Laguna de Apoyo. Photo Jeffrey McCrary. The reforestation volunteers were enthusiastic! Photo Jeffrey McCrary. 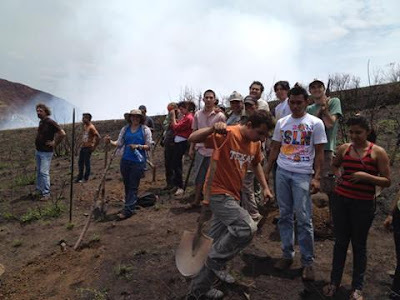 The reforestation activity, performed by environmental volunteers and the staff of the Volcano Masaya National Park, was covered by the national newspaper, La Prensa. Every volunteer was happy to participate. The event was actually fun! The ground was covered in black ash from the forest fire, and charcoal from the branches and stems that were burned.. We found rich soil in a shallow layer, followed by volcanic gravel beneath, as we dug holes for planting stakes. Photo Jeffrey McCrary. Volunteers for the reforestation project came from Masaya, Nindiri, Managua, and Laguna de Apoyo. Photo Jeffrey McCrary. Reforestation in Nicaragua is greatly needed in many areas. So many forests have been degraded or destroyed by fires, expansion of agriculture and clearing for wood use. We are happy to have participated, especially because we saw the enthusiasm of the Nicaraguan volunteers. No one provided meals or expense accounts, everyone just came and gave their time and energy, and returned home sweaty and covered in dirt and ash, knowing that Volcano Masaya is better protected than before. The ash from the fire is evident around the hole dug by these volunteers. Photo by Jeffrey McCrary. If you would like to participate in meaningful projects which have a place in the greater benefit of Nicaraguans, then consider being a volunteer with FUNDECI/GAIA. You can help save the planet, one tree at a time. 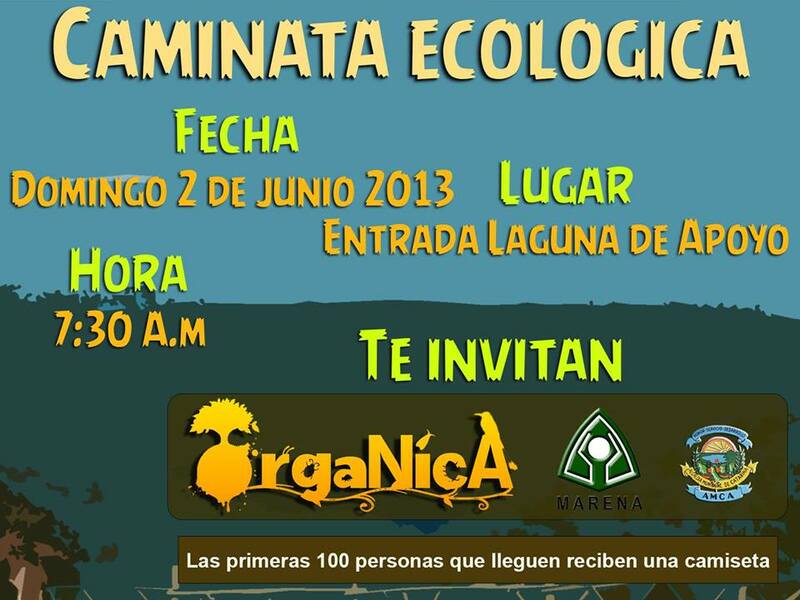 It is easy to be an environmental volunteer in Nicaragua. There are many environmental projects and activities, and there is always something to do for every volunteer. Our contribution was small, but these reforestation volunteers are happy to have participated! Photo Lenin Medina. Click on the "escudo" for more information. Nicaragua is a poor country with lots of natural resources at risk in a rapidly changing socio-economic environment. Whole forests can disappear overnight, lakes can go from pristine to polluted before anyone notices, and species may go extinct without ever getting a name in the first place. FUNDECI/GAIA has developed Conservation Science Internships to promote the protection of Nicaragua's delicate and wonderful natural world. Pier-Olivier Beaudrault, from Sherbrooke University in Quebec, studied the birds of Laguna de Apoyo Nature Reserve. During his internship, he established five monitoring sites for flora and fauna and began collecting data in a project that has now lasted five years. Photo by Catherine Bard-Descheneau. The forests of the tropics face grave challenges in the twenty-first century. The worldwide construction wood business affects forests globally, as does urbanization locally. Furthermore, poverty drives many people to cut firewood from forests for sustenance and income. Our interns develop useful information to guide the community about what is important in the natural important and how to protect it. Many of our conservation science interns are students of biology or environmental science, but not all of them. If you would like to participate as a conservation science intern, you don't need to be planning a career in biology. In fact, we can use people of many types of skills which can apply to our projects, ranging from science students to people dedicated to education, computers, construction, and even journalism. There are many ways in which someone can contribute. Three of our Conservation Science Interns from Holland produced a video about their projects. We hope you like it. Please take a look! 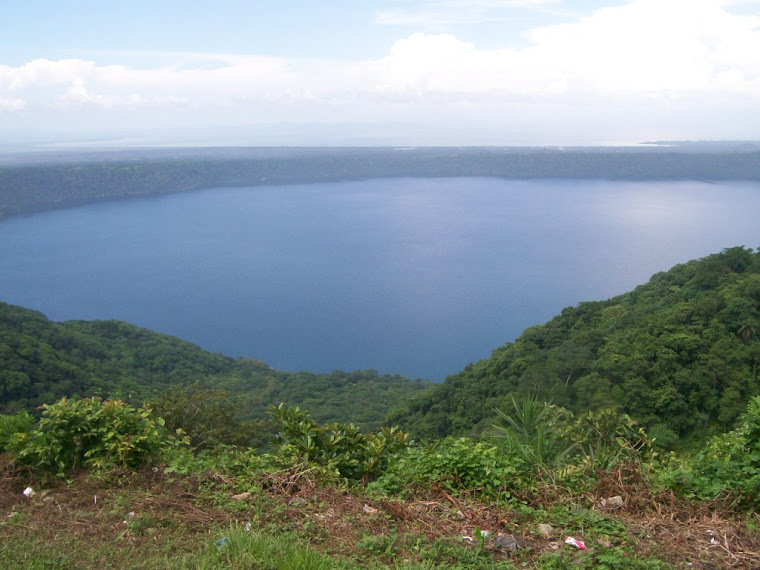 Our focus is on protecting the natural resources of Laguna de Apoyo Nature Reserve. This means a lot more than just counting the monkeys and birds. It also means working with the people of the area. As a result, interns with diverse areas of professional development can be involved, all coinciding in a love of wild nature and a desire to help poor, rural people live more prosperous lives, sustainably. Mara McPartland is an ecologist from Bennington College in the United States. She is making a presentation on the variations in the bird communities in Laguna de Apoyo, according to human impacts on the forest in each site. Photo by Laura Ruysseveldt. Our Conservation Science Interns may study some aspect of the biodiversity in the lake or the terrestrial system of the Laguna de Apoyo Nature Reserve. 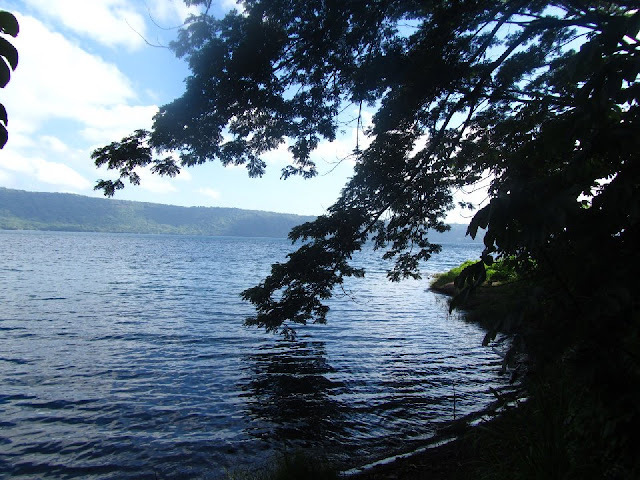 Data gathered in field work is later used for purposes of advancing scientific knowledge and protecting the wild ecosystems found in Laguna de Apoyo Nature Reserve and other natural areas. Nicaraguans and foreigners will work closely on all projects. Our current projects for interns include: care and promotion of rescue animals; organization and outreach for conservation and environmental education activities; and wildlife conservation and biodiversity research. We have been studying the bats of Laguna de Apoyo Nature Reserve a while. Three volunteers, Michael Persicke, Lukas Betthaeusen, and Florian Schmid, all have made great contributions to our knowledge of the bats of our area during their volunteer periods sponsored by GIZ. We have 27 bat species on our list, about a quarter of all the species documented in Nicaragua, among the more than 600 bats captured in our studies to date. Nonetheless, there is always something new and special out there. Our technician Elmer Nicaragua noticed a small bat hanging from the roof of our patio, and we quickly concluded it was not any of the species we know to be in Laguna de Apoyo Nature Reserve. Elmer captured it with a butterfly net, and we examined it. Wagner's Mustached Bat, Pteronotus personatus, has relatively long, thin wings. Photo by Elizabeth Loudon. The tiny bat was quickly identified by its distinctive face, long wings, and lack of a wing-sac which some species have. The face was distinctive, with a large flap on the chin. And, of course, hair over the upper lip, hence the name Wagner's Mustached Bat. This little male Wagner's Mustached Bat is a fully grown male. Photo by Elizabeth Loudon. Wagner's Mustached Bat consumes insects, and uses Doppler shifts in echolocation. This bat species is not well-known in Nicaragua, and this was our first record of it in Laguna de Apoyo Nature Reserve. This tiny bat (Pteronotus personatus) has several unique features on the face and head that may be aids in echolocation. Photo by Elizabeth Loudon. We are not surprised at this finding, because we are sure there are many more species of bats in Laguna de Apoyo Nature Reserve than the 27 documented species to date. Our presence here in the reserve, however, and the careful eye of Elmer Nicaragua, allowed us to make this new species record, thanks to his careful, trained eye. Adult male Wagner's Mustached Bat (Pteronotus personatus), captured in Estacion Biologica, Laguna de Apoyo Nature Reserve, Nicaragua, 20 May, 2013. Photo by Elizabeth Loudon. This bat supposedly roosts in warm caves, but it is likely that this individual just got lost and chose our roof for his rest during the day. He is one more example of the importance of Laguna de Apoyo Nature Reserve to the wildlife of Nicaragua. Our little bat takes a few minutes to rest on the clothesline before flying away. Photo by Elizabeth Loudon. At FUNDECI/GAIA, we conduct diverse activities to protect wild nature in Nicaragua. Volunteers and conservation science interns are always welcomed. Would you like to work as a conservation science intern? Contact us for more details. The Central American Banded Gecko is very attractive, but its intricate pattern hides it well among leaf litter during the dry season. Photo by Laura Ruysseveldt. 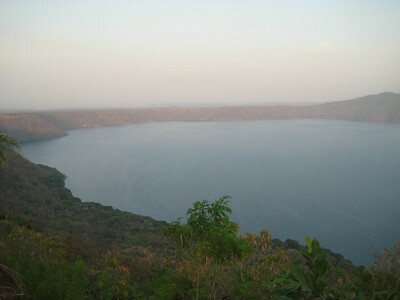 The tropical dry forest habitat of Laguna de Apoyo Nature Reserve dictates the kinds of animals found here. Both plants and animals must tolerate long months without rain, and in many areas, steeply inclined soils stripped of nutrients. Several species of lizards adapt well to the habitats found here, as conservation science interns Bryan Minne and Laura Ruysseveldt from Ghent University in Belgium found during their studies here. The Central American Banded Gecko, Coleonyx mitratus, is uncommon in Laguna de Apoyo Nature Reserve. Photo by Laura Ruysseveldt. Bryan and Laura spent a few months in Nicaragua, studying the geckos and other reptiles and amphibians of Laguna de Apoyo Nature Reserve. They turned up some solid information on gecko habitats, particularly regarding the recently introduced Asian house gecko, Hemidactylus frenatus, and its impact on native gecko species. Field research on lizards and other herps usually includes a difficult process of identification. Photo by Laura Ruysseveldt. 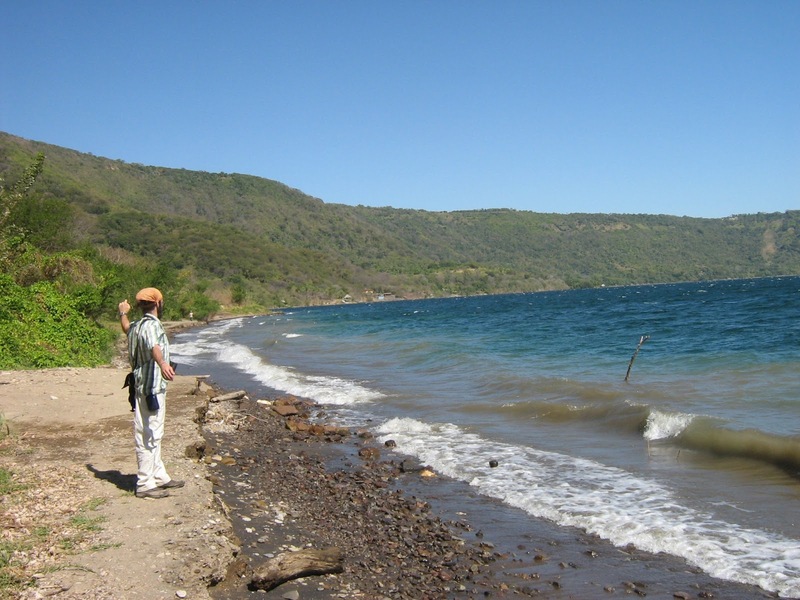 Laura and Bryan also surveyed several habitats in the Laguna de Apoyo Nature Reserve, in search of each of the reptile and amphibian species that could be found here. They were the first to find the Central American Banded Gecko (Coleonyx mitratus), a charismatic little animal that tends to stay on the ground, rather than in trees. Asian house geckos (Hemidactylus frenatus) doing what they do best, which is among the reasons why they are now so abundant in Nicaragua, only a few decades after the first individuals arrived. Photo by Laura Ruysseveldt. Bryan and Jeffrey review trees for study plots for gecko habitats in Laguna de Apoyo Nature Reserve, Nicaragua. Photo by Laura Ruysseveldt. Field work included systematic reviews of habitats for geckos to determine how native species, particularly the Yellow-headed Gecko (Gonatodes albogularis) and the Yellow-bellied Gecko (Phyllodactylus tuberculosus) are responding to the invasion of the Asian House Gecko (Hemidactylus frenatus). Their project yielded some rigorous results, and they sweated a lot on long walks, but we are sure they are happy they came! The Black-bellied Racerunner, Cnemidophorus deppei, is elusive and difficult to photograph in the wild. Photo by Laura Ruysseveldt. The Black Iguana, Ctenosaura similis, is an effective symbol for forest destruction in Nicaragua, as poachers often set forest fires to hunt them during the dry season. Photo by Laura Ruysseveldt. We often ask ourselves how can we assure the protection of lizards and other wildlife in Nicaragua. By sponsoring conservation science internships for students such as Laura and Bryan, we are learning more about our herpetofauna, including what problems each species may be facing. For instance, while surveying the reptiles in our area, the staff at Estacion Biologica, along with Laura and Bryan, witnessed an attempt to capture a large Black Iguana (Ctenosaura similis). We stopped the hunters as they chased the animal through a ravine, and then reported the activity of these people to the park rangers, who responded within minutes to warn the people that hunting is illegal inside the Laguna de Apoyo Nature Reserve. The Rose-bellied Lizard, Sceloporus variabilis, is a close relative to several fence lizards found in the US and Mesoamerica, and is abundant in rocky and dry areas. Photo by Laura Ruysseveldt. Forest fires are often set to hunt iguanas and mammals. The fires destroy the habitat of and kill many smaller reptiles and other mammals, too. Laura and Bryan participated in extinguishing a forest fire that burned several hectares, just behind Estacion Biologica. Many animals live precariously in the forests where humans may abuse them in numerous ways. Bryan examines a captured specimen before making a presentation on the reptiles of our area to the students of a local school. Photo by Laura Ruysseveldt. Bryan and Laura returned to their studies in Belgium after completing a detailed, quantitative project as well as lots of time in the jungle, in search of lizards and other reptiles, and hopefully, we can utilize their knowledge to promote better stewardship of wild nature in Nicaragua.